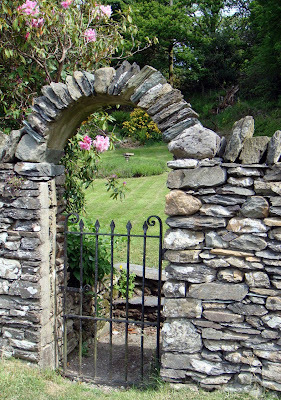 This is a gate that I passed while walking a beautiful trail towards Beatrix Potter's Hilltop Farm in the Lake District of England. I had never seen such pastoral beauty before this. The path meandered across farms, past sheep, under gnarled old trees resting next to equally old stone fences. Every now and then I would pass a little stream of such tranquility that I would stop and rest with it. I remember there were huge cotton ball clouds drifting high up in the sky. It was such a breathtaking day! I felt so alive and excited about the discoveries of life! This is how I want the next phase of my life to be, like this path felt to me on that day two years ago....and this gate represents the new path I am about to enter after many years of joyous full time mothering. My two youngest have left for university and I find myself here in my house, a very quiet house, pausing and feeling the change. Pausing is good, I want to feel this and then feel the shift as I move on. My intention is to see beauty everywhere, everyday. I don't have to be in England or anywhere else, I might be in my kitchen....and I will experience the beauty in the moment. I also want to feel the excitement of living a creative life! To feel fully alive and expansive. I happen to love the art of beatrix potter. The first art book I bought at age 9 was The Art of Beatrix Potter" I still have it!!! What lays ahead, I wish you health and happiness! Thank you Peggy! I love Beatrix Potter and all her stories. Standing in her home felt so amazing to me. I didn't want to leave! Terri - Congraulations on embracing this next phase of your life. Although you may feel the empty next every once in a while, you are one of the few with the understanding that you have your creative ideas to explore. I love your photo and have one of my favorite photos from London of my "fairy tree" - it is a bare old willow in the middle of a park down the path from the Peter Pan statue. I print it out onto transparencies and then use it in art work. Thank you Marlynn! The house does feel strangely empty! But I am quite busy with all kinds of projects. I would love to see the photo of your "fairy tree". Dear sweet Rhonda, you have brought tears to my eyes! I feel very blessed to be getting to know you and to see how vibrantly creatively alive you are now! You are a joy! Enjoy every step on your path! Go live your dreams big and small..go through that gate and enjoy...I know that gate I have been there many years ago... Betrix potter and the lake district. If you are to be more creative would you care to take on the ATC challenge over here. do hope that you can join us. Thank you so much Karen and Chrissy! I love reading your comments, and I will look at the ATC challenge. I have been creating some lately and I do enjoy it!